What’s a country to do when it’s local scenery is breath-taking but it's national media budget to attract international visitors is rather small? One simply looks for another form of communication. And that’s just what the Ecuador Ministry of Tourism has done with the assistance of the Zimmerman Agency (absolutely NO connection to the sad George Zimmerman trial case in Florida). Ever year Ecuador exports 24,000,000 top grade bananas to the rest of the world. Why pay for expensive full page ads in the New York Times or launch a series multi city gala events when millions of those humble bananas could carry Ecuador’s tourist information instead? 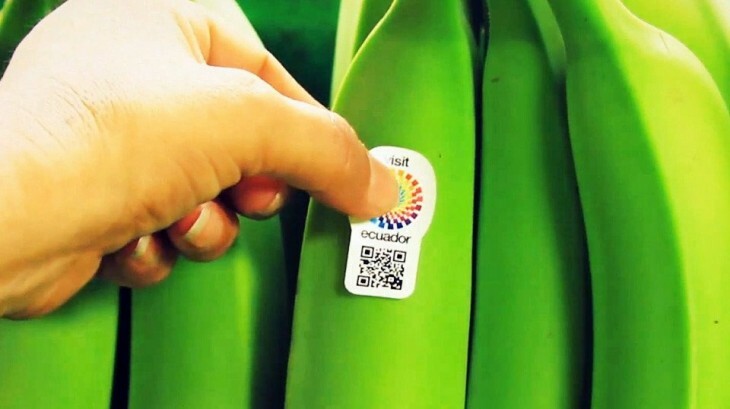 Just attach a QR (short for “quick response”) label to each banana and prompt the curious consumer to scan the label with their mobile phone ap. Once scan, an attractive and informative YouTube video will appear to entice the banana purchaser to experience the wonders of Ecuador in person. Simple, easy, inexpensive, creative, informative and successful – Bravo to the staff of the Ecuador Ministry of Tourism and the Zimmerman Agency. Well done! Posted on July 22, 2013 by Ana Kinkaid and filed under Agriculture, Creativity, Culinary History, Design, Food, Gala, Technology, Travel, Trends and tagged Beautiful Beaches Culinary Rourism Cultural Tourism Ecuador Ministry of Tourism George Zimmerman Trail Marketing Food Mountain Vacations QR Labels om Ecuador Bananas Zimmerman Agency.